U.S. stock futures rose, following a better-than-expected employment report Wednesday. Payroll processor ADP said nation gained 162,000 private sector jobs in September. The report is considered a prelude to the government's closely watched monthly jobs data, which is due out this Friday. Investors are hoping to see a rebound in the labor market after last month's grim report. Gains may be tempered by ongoing worries about Europe, specifically Spain, where there's mounting pressure for the nation to formally request a bailout. Late Tuesday, Spanish Prime Minister Mariano Rajoy said a bailout request was not imminent. European stocks were mixed in morning trading. Britain's FTSE 100 gained 0.1%, while the DAX in Germany was flat and France's CAC 40 edged 0.2% lower. Asian markets ended the session mixed, with markets in Shanghai closed for a holiday. The Hang Seng in Hong Kong added 0.1% while Japan's Nikkei lost 0.5%. In the U.S., investors started Wednesday with a report showing mortgage applications spiked last week. The Mortgage Bankers Association's index, which measures mortgage applications, rose 16.6% for the week ended Sept. 28. That's a big jump from the prior week's 2.8% increase. Due after the opening bell, the Institute for Supply Management will release its monthly report on the services sector. U.S. stocks finished mixed Tuesday. Companies: Shares of Best Buy (BBY)jumped 3% following reports that founder Richard Schultze and at least four private equity firms have started examining Best Buy's books in advance of a potential $11 billion buyout offer. MetroPCS (PCS) shares rose nearly 3% following reports that Deutsche Telekom's board had approved a merger of its T-Mobile USA unit with MetroPCS. Family Dollar (FDO) shares gained more than 1% after the company reported fourth-quarter earnings and sales that were in line with forecasts, and said it planned to open 500 stores next year. But the gains were offset by Family Dollar's lowered guidance for the first quarter. Shares of agribusiness giant Monsanto (MON) fell 3% after it reported a worse-than-expected quarterly loss. 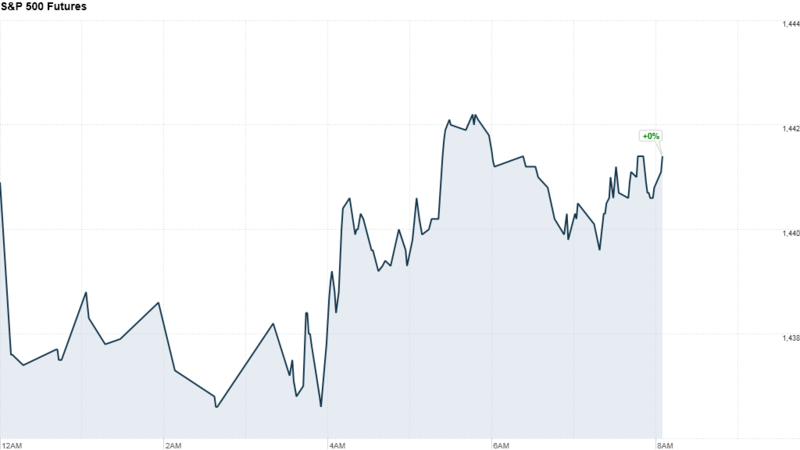 Apple (AAPL)shares edged higher after the Wall Street Journal reported production had begun on a mini iPad. Currencies and commodities: The dollar slipped against the euro, but gained against the British pound and Japanese yen. Oil for November delivery fell 63 cents to $91.26 a barrel. Gold futures for December delivery rose $4.20 to $1,779.80 an ounce. Bonds: The price on the benchmark 10-year U.S. Treasury remained unchanged from late Tuesday, with the yield at 1.61%.